This hike takes you to a sweeping vantage from El Capitan’s domed summit. From the campground, this trail gradually works its way down through a fantastic old forest. Large trees line much of the hike with occasional huge boulders and a couple of smaller streams; most notably Cascade Creek with a small cascade. Shortly after Cascade Creek, the signed trail for El Capitan breaks off to the left and begins its incredibly steep climb up through the trees. Occasional breaks in the trees give you vantages as you gain elevation. The grade eases as you work your way along a more open ridge before descending back into the trees to Ribbon Meadow with it’s great collection of flowers. You’ll follow along a seasonal stream to Ribbon Creek where you’ll hop over it and climb back up out of the shade of the trees. Views of the western end of Yosemite Valley get better as you traverse along the drier landscape. The trail skirts precipitously above El Capitan Gully before working out to the humble, domed summit of El Capitan. 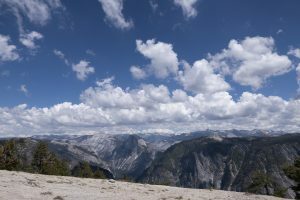 From here, you have wonderful panoramic views of distant summits and into Tenaya Canyon with Half Dome looming over it. A shorter alternative to the summit, with more elevation gain, ascends from the Upper Yosemite Fall Trail for a round-trip distance of 14.7mi/23.6km and 5,900ft/1,770m total elevation change. Trailhead: Take the Tioga Road to the road for Tamarack Campground. Park in the campground and walk down the road to the gated old Big Oak Flat Road. 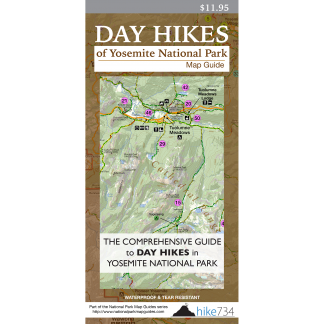 If hiking via the Upper Yosemite Fall Trail, take the free bus shuttle to the Yosemite Falls stop #7 or park at the Yosemite Falls parking area near Camp 4.